Introductory sale, to get 30% off the listing price $299. Limited offer, first come first serve. 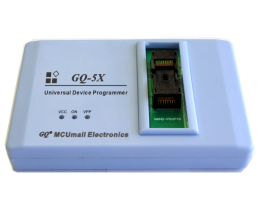 GQ-5X Professional Level Super Fast NAND Flash Programmer. Support any NAND flash chip(TSOP48 package on this top module). All chips with ONFI feature will be automatically supported. No NAND chip size limitation. Highest speed provides most efficient work. Easy change to any other professional level programmer. By using GQ Blaster software, users are able to add their own chips. Raw data write provide a best tool to backup NAND flash data. NAND Reading speed above 12 Mbytes/second. A 1G bytes NAND chips only takes 98 seconds on reading. TSOP48ZIF socket ready for all TSOP48 NAND flash. More NAND function will be added in the future.